In an episode known as the Mediterranean Salinity Crisis, the Mediterranean Sea was isolated from the North Atlantic and completely dried out about six million years ago, leaving a desert with extensive salt deposits across its floor. 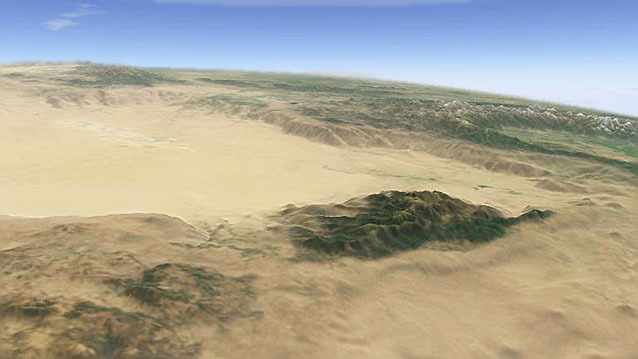 This still from an animation sequence shows the dry floor of the Western Mediterranean basin between the forested mountains of Corsica and Sardinia (foreground) and the Alps and South of France (background). We used detailed bathymetric data for the shape of the sea floor, with texture taken from satellite images of desert and semi-desert areas overlaid to add realism.